Built in the Gothic style of architecture using local brick, it opened originally for boys, but a girls department was added in 1849. Workers’ children were educated for free whilst other children paid 3d or 6d weekly. The running of the School was taken over by Dawley School Board in 1887 and over the years it went through many structural and functional changes and additions. It became Primary School when the Secondary School opened on the adjacent site in 1956ecame a Junior School when an Infant School was built in an adjacent building. However in 1977 the school was destroyed by arson. Two boys who did not attend the school were convicted of the attack. The Junior School was rebuilt and the two schools united in 1980 to form the Captain Webb County Primary School. The Darby family was interested in the welfare of their employees in the Coalbrookdale Company. A voluntary collection for workmen who were ill or who had had an accident and could not work was established and by 1835 this turned into a weekly subscription. In 1840 with Alfred Darby’s support a set of rules for the club were established and he gave proceeds from fines and deductions from wages for poor work in the forge and rolling mills to the fund, in addition to his own subscription on behalf of the company. Funds grew substantially. Darby established a small temporary school in the stable loft at Horsehay farm for male children of his workers which proved very successful this gave him the impetus to build the new school for workers’ children at Pool Hill which opened in 1846, at first to boys only and then in 1849 was a girls department opened. The school was built to accommodate more than 700 children, for most of its life it never saw those sorts of numbers attending. 1855 it had 270 pupils on roll and in 1903 there were 297 pupils attending. The club made a monthly contribution towards the running costs of the school and in return workers children were educated free of charge. Children whose parents did not work for the Coalbrookdale Company had to pay 3d or 6d weekly. 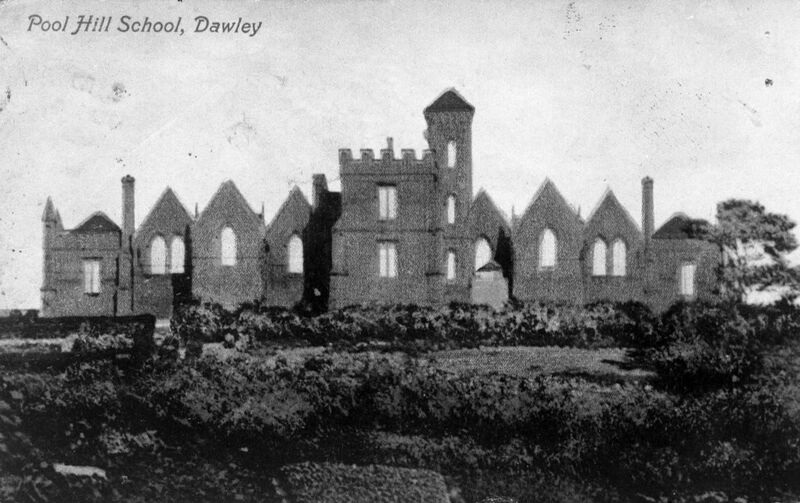 The running of the School was taken over by Dawley School Board in 1887 when the Company could no longer afford to maintain the school because of the trade depression at that time. Over the years it went through many structural and functional changes and additions. A view of archive photos will reveal these changes, which in latter years included demountable classrooms on the site and an addition just after the turn of the 20th century a separate building for domestic science to which children from other local schools would attend for their weekly classes in household management. It became a Primary School when the Secondary School opened on the adjacent site in 1956 and it became a Junior School when an Infant School was built in an adjacent building. However in 1977 the school was destroyed by arson. Two boys who did not attend the school were convicted of the attack. The Junior School was rebuilt and the two schools united in 1980 to form the Captain Webb County Primary School which had 481 children on roll that year.